and Why They Can Help You Write Yours!! I always tell my students that one of the best ways to find great topic ideas is to read the essays of other students. One great idea often triggers another! Reading other student’s essays also can give you an idea of the narrative style or voice of these essays, which is looser and more conversational than your typical academic essay. My favorite online collection is on John Hopkins’ web site. Most use a narrative style and write in a direct, natural voice. And they even have a short analysis from the admissions folks about what they liked and why. This is invaluable info for you guys! Click HERE to read them. 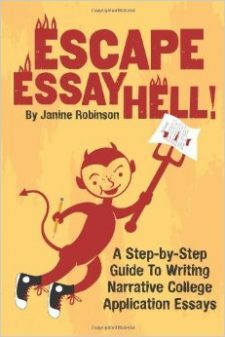 Click HERE and HERE to read some of the inspiring narrative sample essays from my collection, Heavenly Essays. Ready to write your own? Try my Jumpstart Guide to help get you started! Need more help finding that magic topic idea? Click HERE for more tips. *Note: If you want to read an introduction that uses the dreaded English-ese (see definition below) check out the second essay, by a student named Olivia Rabbitt, on Connecticut College’s essay page. Her first paragraph is so stuffy and over-written I could barely force myself through it! Great example of adjective abuse. After that first paragraph, though, Olivia shifts into more direct language and the rest is great! English-ese: This is a word I just made up to define that bizarre “language” that students (and a lot of adults) use because they think that’s what readers (their English teachers, parents, bosses…) want and what makes them sound smart. I’m sure you would recognize it if you read or heard it. This is an exaggeration, but don’t you recognize that sluggish, smug tone? Maybe people apparently like it because it sounds intellectual and ponderous, as if you were talking from an oversized armchair smoking a pipe. But doesn’t listening to those types of pompous blowhards bore you to death? Thanks for all the tips on your blog! I find them super helpful. Although this one time, I didn’t (sorry). The examples of essays, while they probably have good writing, were definitely not the kicker for these accepted students. What they’ve done (crazy big projects, winning competitions) is why they got in, not their essays! It discourages me to even read those essays because I don’t have some crazy science competition under my sleeve.